It was so great to see the addition of a Library feature as part of the latest upgrade to Camtasia 3 to Camtasia 2018 Macintosh. I have been producing explainer videos on my Windows 10 PC as well as my Macintosh OS High Sierra version 10.13.6 for quite some time. I go back and forth between the two operating systems with ease frequently. In Camtasia 9.1 on Windows I created Library Assets that took a bit of effort and time. If I could get those same Library Assets into my Camtasia 2018 Macintosh, then I could use them across all of my Camtasia 2018 Mac projects. That way I could be more efficient in my Mac Camtasia projects. And wouldn’t have to recreate these Library assets on the Macintosh! I saved time in Camtasia 9.1 by using these Library Assets in many of my Camtasia projects there. I did understand that in the upgrades to Camtasia 2018 Mac and Camtasia 2018 Windows, I can share Library assets between these two apps and operating systems. And I learned that I can import Camtasia 9.1 Library Assets into Camtasia 2018 Windows. In addition, I found out that Camtasia 2018 Windows Library Assets are not backward compatible to Camtasia 9.1. There is a Camtasia 2018 Windows Library command Library -> User Libraries -> Camtasia 9.1 (Needs upgrade)… That command is designed so that your entire Camtasia 9.1 Library is imported into your Camtasia 2018 Windows Library. But when I tried that it didn’t work! Camtasia 2018 Windows couldn’t upgrade my Camtasia 9.1 Library and wasn’t able to import it! I submitted a ticket to the wonderfully helpful (I mean that!) TechSmith support. They think it might be the size of my Camtasia 9.1 Library. They are working on solving the technical stuff. And I worked out a way to do it without wholesale importing of my Library Assets! How to get my Camtasia 9.1 Library Assets to Camtasia 2018 on the Macintosh? Yes, I figured it out. First, I have made some assumptions about your setup. This is my setup! You know what a Library Asset is and have created them in Camtasia 9.1. You have Camtasia 2018 Macintosh installed on your Macintosh. The Camtasia Library is like a media bin that is shared across all your projects. Any media that you add to the Library is stored locally and is readily available in any Camtasia project on your computer. I use this feature all the time! And, now I’m thrilled that this feature is in Camtasia 2018 Mac. Opens up new possibilities. When you export a Library Asset, Camtasia creates a Library Zip File. The files extension is *.libzip, a special kind of Zip file. When you put a Library Asset from your Library to your Timeline, you can edit the media in any way you like. The Library Asset in your Library isn’t affected. Instead of directly from Camtasia 9.1 to Camtasia 2018 Mac, I added an intermediate step! 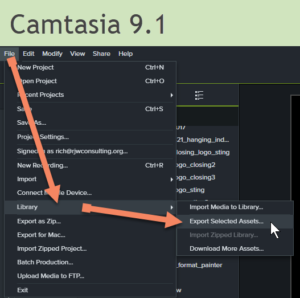 Export specific Library Assets from Camtasia 9.1. 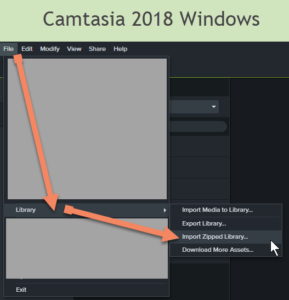 Import those Library Assets’ Library Zip File into Camtasia 2018 Windows. Select and export those specific Library Assets from Camtasia 2018 Windows. Copy the exported Library Assets’ Library Zip File from Step C. above onto your Macintosh. 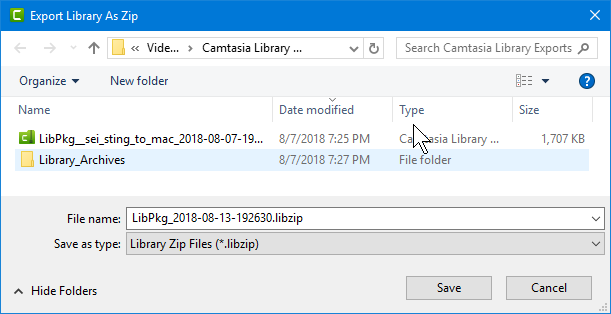 Import those Library Assets’ Library Zip File into Camtasia 2018 Macintosh. That seems like a lot of work, but it really moves very fast, once you get the hang of it! I’ve done all the hard work for you! Now for the Detailed How-To Steps! Step: A. Export specific Library Assets from Camtasia 9.1. 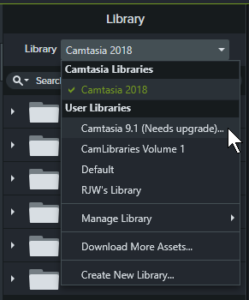 In Camtasia 9.1, click or select the Library Asset you want to get into Camtasia 2018 Macintosh. You can shift click, or Ctrl-click to select multiple Library Assets. ~ If you want only one specific Library Asset, you can Right-click it. ~ Click the Folder icon to change to a different folder to save the Export. 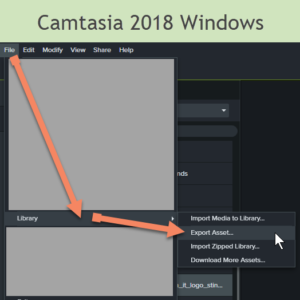 Step B: Import those Library Assets’ Library Zip File into Camtasia 2018 Windows. Select Import Zipped Library, Navigate to the folder where you saved the Library Zip File (*.libzip). Select (click) the *.libzip you want to import. Click Open, and the Zipped Library is unzipped into your Camtasia 2018 Windows Library. Alternatively, You can go to File -> Library -> Import Zip Library, Navigate to the folder where you saved the Library Zip File (*.libzip). ~ Select the *.libzip you want to import. ~ On the Import to Library dialog box, in the Add to: drop-down menu, select the Library where you want this Zipped Library. ~ The Zipped Library is unzipped into your selected Camtasia 2018 Windows Library. 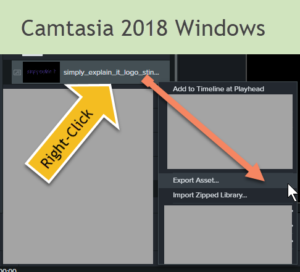 Step C: Select and export those specific Library Assets from Camtasia 2018 Windows. 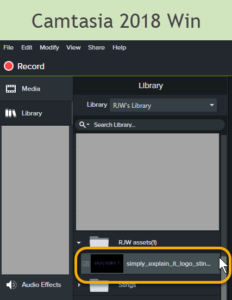 In Camtasia 2018 Windows, navigate to the Library where the Asset resides. Go to File -> Library -> Export Asset. Click Save to save the Library Zip File (*.libzip).into the folder where you navigated to. ~ Alternatively, in the Library where your asset resides, you can Right-click on the Asset, choose Export Asset. ~ Click Save to save the Library Zip File (*.libzip) into the folder where you navigated to. Step D. Copy the exported Library Assets’ Library Zip File from Step C. above onto your Macintosh. 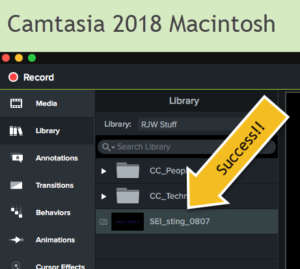 Step E. Import those Library Assets’ Library Zip File into Camtasia 2018 Macintosh. In your Macintosh Finder, open the folder where you copied your Library Zip File (*.libzip). Double-click the Library Zip File (*.libzip). If your Camtasia 2018 Macintosh is not running, it will launch. You’ll be presented with the Import Library dialog box. From the Add to: drop down menu select the Library you want the asset to be in. The Zipped Library is unzipped into your selected Camtasia 2018 Macintosh Library. ~ Alternatively, when Camtasia 2018 Macintosh is running, Right-click in any Library except the “Camtasia 2018 Library” where you want the Library Asset, choose Import Zipped Library. ~ Navigate to the folder and select the desired *.libzip. ~ You’ll see the Import Library dialog box. ~ From the Add to: drop down menu select the Library you want the asset to be in. Now you have in your Camtasia 2018 Macintosh Library that Camtasia 9.1 Library Asset that you worked so hard on! And now it’s available to you in all your Camtasia 2018 Macintosh projects! See, it really wasn’t that hard, was it? I wrote about sharing Camtasia 2018 projects in my blog post here! 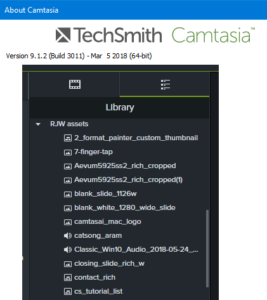 Camtasia 2018 Windows Library Assets are not backward compatible to Camtasia 9.1. Camtasia 9.1 Library Assets that include the following media are not compatible with Camtasia 2018 Macintosh. That means that the Camtasia 9.1 Library Assets could successfully import into your Camtasia 2018 Macintosh using my work flow above, the media listed below will simply not be in that imported Library asset. I know I’m late to blogging! Duh! Since this is my first blog post on Simply Explain It, I thought I would tell you why I’m diving into this fun! 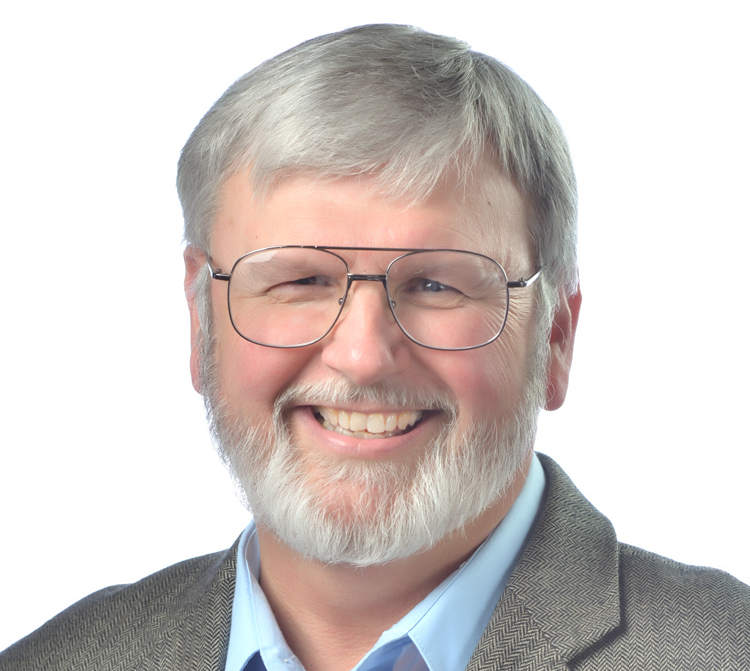 My vision is to help you folks who are learning and using TechSmith’s Camtasia on the Mac and Windows to advance your skills. I’ve been producing videos with Camtasia and Snagit since 2008. I’ve been comfortable working back and forth between these platforms. And I’ve been helping folks learn how to be more and more productive on the Macintosh and Windows since before 1998. I’ve met many lovely creators along the way and I thought I would burst on the web now! I hope to meet you soon, too. I’m eager to hear what you might be struggling with producing your videos with Camtasia or any other apps. Let’s see what we can learn together! Thank you so much for reading through to here! I do so appreciate you. Camtasia, Camtasia Studio, Jing, Screencast, Screencast.com, Snagit, TechSmith, TechSmith AppShow, TechSmith Fuse, TechSmith Screencast, TechSmith Smart Player, and TSCC are either registered marks or marks of TechSmith Corporation in the U.S. and/or other countries. This list is not a comprehensive list of all TechSmith Corporation marks. The absence of a name/mark or logo in this notice does not constitute a waiver of any intellectual property rights that TechSmith Corporation has established in any of its product, feature or service names/marks or logos. All other marks are the property of their respective owners. Interested in Free Camtasia Tips Like This One? 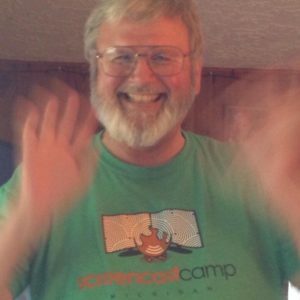 My vision is to help you folks who are learning and using TechSmith’s Camtasia on the Mac and Windows to advance your skills. I’ve been producing videos with Camtasia and Snagit since 2008. I’ve been comfortable working back and forth between these platforms. And I’ve been helping folks learn how to be more and more productive on the Macintosh and Windows since before 1998. I’ve met many lovely creators along the way and I thought I would burst on the web now! I hope to meet you soon, too. I’m eager to hear what you might be struggling with producing your videos with Camtasia or any other apps. Let’s see what we can learn together! I do so appreciate your visit to my blog!